At United Service Co. we can send you a qualified refrigerated warehouse technician. North Shore businesses often require temperature-controlled settings to preserve produce, pet products, medicines, and other perishables. Our business has served locals since 1953. We’ve built a reputation for success in refrigeration development and services. 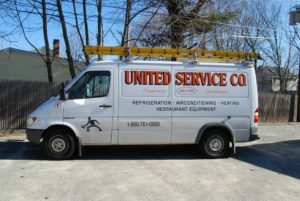 Whether you need a new refrigerated unit or reliable refrigeration services, come to United Service Co.
We have a refrigerated warehouse technician in North Shore you can trust. Call us today for more information. Warehouses stock many different items including freshly cut flowers and perishable foods, but all refrigerated products share one commonality – they will deteriorate over time. The right temperature and location can ensure a product’s profitability. At United Service Co., we’re in the business of helping other businesses. We recognize the importance of a reliable refrigerated warehouse system. If you’re tired of hoping your system will get you through another quarter, talk to a refrigerated warehouse technician in North Shore. Our technicians are licensed, trained, and experienced. Collectively, we share over 100 years of experience. As job-focused professionals, we listen to our customers. If you’re worried about the temperature of fresh seafood or pharmaceuticals, we make recommendations that will serve your business well. We design, create, install, and maintain refrigerated systems for businesses of all sizes and across all industries. A United Service Co. refrigerated warehouse technician in North Shore can inspect your systems and offer cost-effective support that can boost profitability over time. Explore more about our commercial services. A small business only needs enough inventory to meet the demands of local consumers. It can sell out of certain products without jeopardizing a business model. Warehouses, on the other hand, rely on bulk goods to replenish products for dozens or hundreds of businesses in the Northeast. Climate-control capabilities play a major role in business success. At United Service Co., we are the right source for a trusted refrigerated warehouse technician in North Shore for all business sizes. A United Service Co. refrigerated warehouse technician in North Shore can come to your property, gauge the situation, and recommend a cost-effective course of action for the issue at hand. In some cases, we may extend the life of your walk in freezer so you can really push for increased sales and profitability. In others, we may recommend installing a new refrigerated system capable of passing health inspections and satisfying your customer base right now. Every business is different, and your refrigerated warehouse technician in North Shore will offer customized advice based on your situation. In addition to coolers, freezers, ice makers, and water chillers, our technicians offer complete HVAC and restaurant equipment services. If you’re interested in creating a seamless schedule of facility maintenance, come to United Service Co. for competitive pricing and customer-focused scheduling. With emergency services, experience, and expertise, we know we can earn your long-term warehousing business. For more information on finding the right refrigerated warehouse technician, North Shore companies can reach our team at (800) 761-0900 or (978) 750-5600.